A positive effect of the drought? 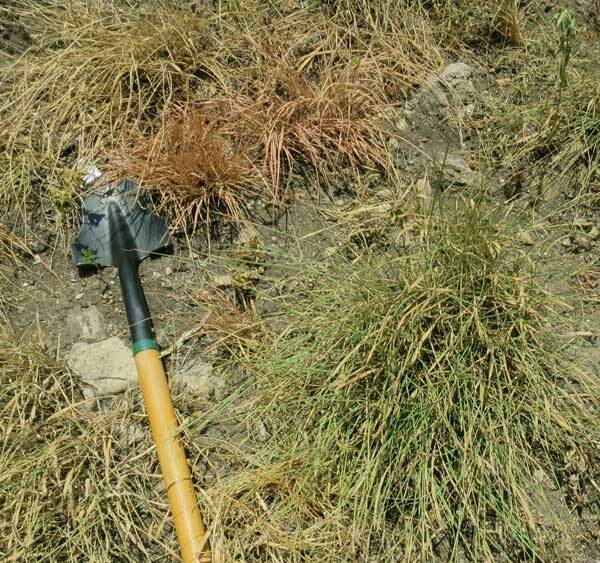 Bluegrass (Poa pratensis), an undesirable component of prairies, is much more sensitive to drought than prairie grasses. 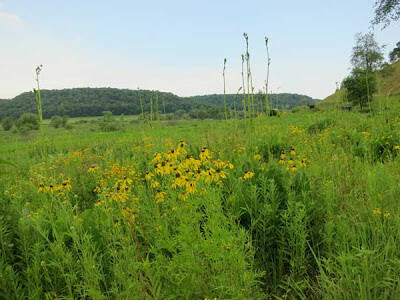 Black Earth Rettenmund Prairie has areas where bluegrass is still prominent, a legacy of former times. A brief survey showed that the drought has killed most of this bluegrass, leaving prominent bare areas. Former bluegrass area (between the forbs), now bare ground. 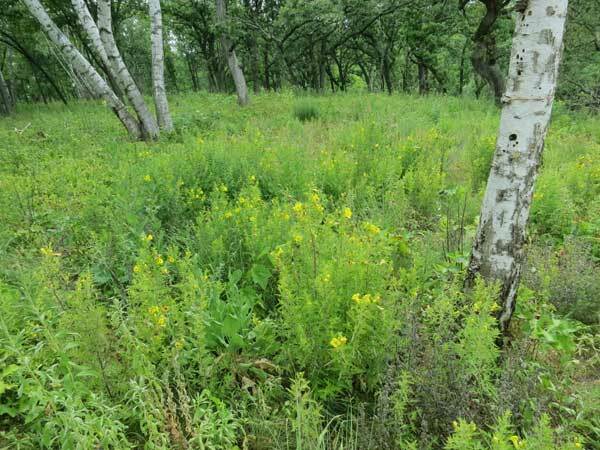 Hopefully, prairie grasses will be able to take over these bare areas. Amazing what a little bit of rain will do! At Pleasant Valley Conservancy we missed some of the rains that passed through southern Wisconsin but we did get about 1.5" total spread out over about a week. This helped a lot and the prairie grasses have snapped back. Our most critical area was the south-facing slope, which not only receives the full blazing sun, but is very rocky and has very thin soils. The principal grass is little blue stem, which with the thin soils is quite shallowly rooted. Before the rain, many of the bunches were completely dry and brown. During the later stages of the drought I marked some of these seemingly "dead" bunches with flags and yesterday I checked them again to see how they had responded to the rain. Several of the larger bunches were now completely green! 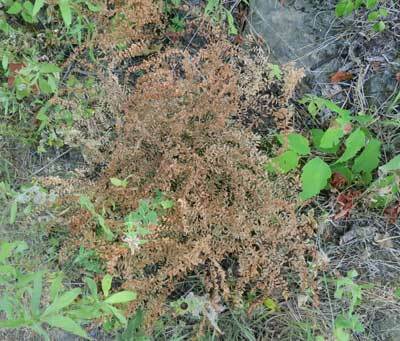 The brown leaves, of course, are still there, but completely crowded out by all the new growth. Little blue stem also looks quite good now in the savanna areas. Also, Indian grass has bounced back. In fact, I saw several Indian grass plants that had started to flower. Considering that southern Wisconsin is still in serious drought conditions (at least as far as agriculture is concerned), it is gratifying to see how quickly the prairies have responded to a little rain. 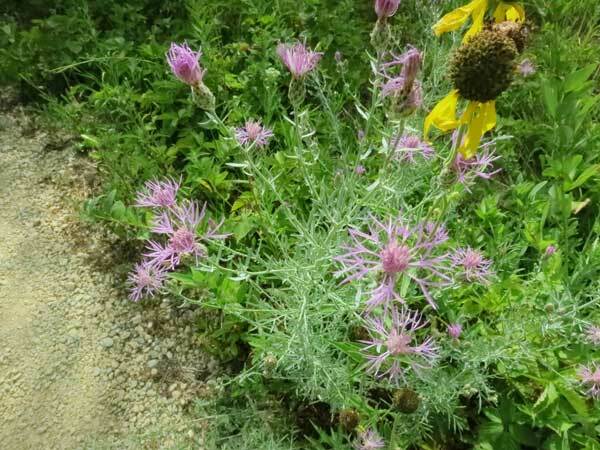 Spotted knapweed (Centaurea biebersteinii) is a nasty invasive weed that competes well in sandy areas. Although we have not generally been plagued with it at Pleasant Valley Conservancy, it has turned up at a few locations along our gravel road. Its presence there was not accidental, as it was brought in with the gravel. When we did a major overhaul of our gravel road in 2007 the contractor brought in lots of loads of gravel, and we were careful to ensure that it was weed-free. However, after the major rainstorms in June 2008 one part of our road suffered a serious wash-out. The contractor was able to repair it, but was unable to get gravel from the same source. It was from this new gravel that spotted knapweed is coming from. 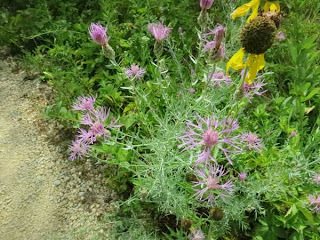 Our general procedure is to walk along the gravel road in early June, when the knapweed is just getting started, and spray it with 2,4-D or Garlon 3A (aqueous). 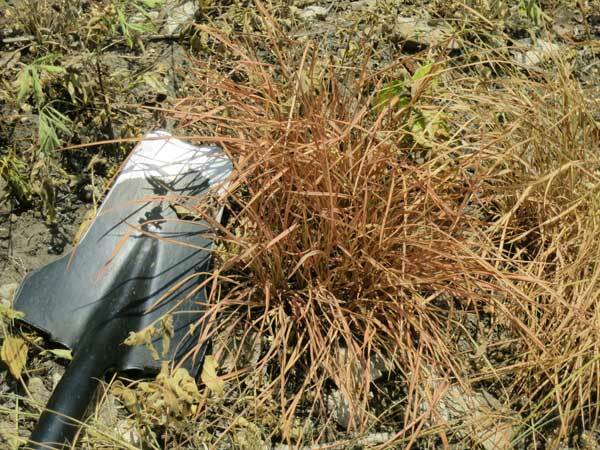 However, the plant shown here was hidden along the edge of the gravel and was missed. Fortunately, knapweed is quite easy to recognize when it is in flower and at this stage it is ideal for my Garlon 4 (in oil) basal stem technique. 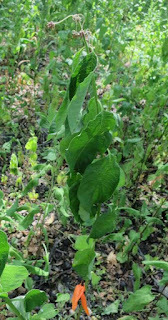 It took less than a minute to spray the bases of the five or six stems of the plant seen here. 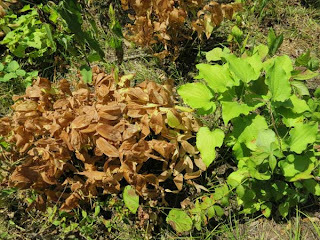 Two other plants at different locations along the road were also found and sprayed. This is not our only fight with spotted knapweed. About five years ago the Town of Vermont rebuilt the whole two miles of Pleasant Valley Road. As part of that project, many loads of gravel were brought in for the shoulders. This gravel had some spotted knapweed mixed in with other weeds. It took us about four years to eradicate this infestation, using the foliar spray technique. The lesson learned here is to catch an infestation when it is still small. We are now "officially" in a serious drought and who knows how long it will last. I find it useful to look at an overview of the drought history of our area, since it helps to put this current situation in perspective. There are a number of different ways of expressing drought, and one index used by climatologists and agriculturalists is the Palmer Drought Severity Index. The Wisconsin Climatology Office has a nice graph that gives Palmer data from 1895 until today, and this graph is interesting to look at. The period that we have been restoring Pleasant Valley Conservancy (1995 to the present) has been primarily a "wet" period. Only 2003 and 2005 have been on the negative side, and these have been not very severe. The major periods of the most serious drought were the early 1930s (the "dust bowl" period) and 1955-1967. There was a sharp peak in 1976-1977 and a less serious one in the late 1980s (the famous Yellowstone fires were in 1988). Is the current drought a brief "blip" or does it represent the first stage in a new major drought period? We'll have to wait and see. Obviously, those years when we were planting new prairies and savannas (1998-2005) were very favorable (that is, wet) years. 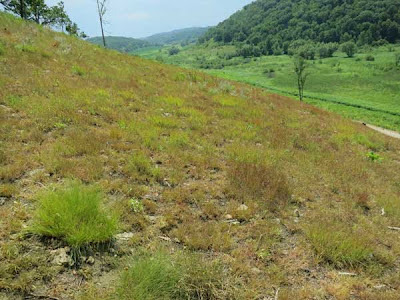 Fortunately, most of our planted prairies and savannas are now well established and will hopefully be able to struggle through the current drought. Only the East Basin, planted in 2009, is at a critical stage (its third growing season) and is hence potentially at risk.We were obviously just lucky that we did our major restoration work during a wet period. Those thinking of planting new prairies now might want to think about the Palmer Drought Index data. 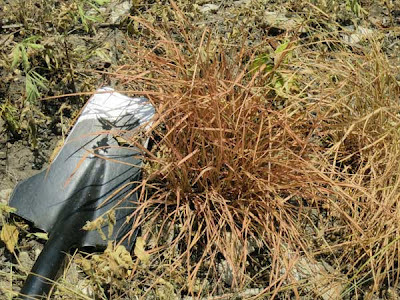 Not surprisingly, our little bluestem is in awful shape. The whole south-facing slope is suffering the worst from dryness and the blazing sun. Many stands of little blue have died, although there are still areas where it is hanging in there. I am assuming ground water is better in areas where it is still green. What the conditions of the roots of these plants is uncertain. We'll just have to wait until it rains, to see whether the roots are still alive. However, the response, if it comes, may not be seen until next year. The response of forbs is highly variable, presumably determined by the specific location, the species, and the depth of their root systems. I was especially interested in purple milkweed. Unfortunately, it is showing signs of severe wilting. Although I haven't checked all of our stands, those I have checked are in extremely bad shape. The photo here is typical. However, other species seem to be thriving. For instance, right next to this purple milkweed stand is a large population of a Special Concern species, upland boneset (Eupatorium sessilifolium), which is in great shape. These two are growing in the same soil under the same canopy and are getting the same moisture. The root system must be making all the difference. Aureolaria grandiflora, the large-flowered yellow false foxglove, is now in full bloom. This species (C value of 8) is parasitic on roots of oaks and is a characteristic species of rich oak savannas. 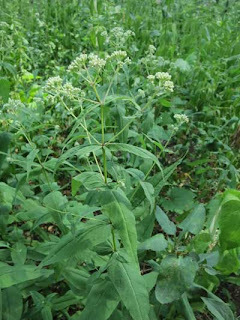 We introduced this about 10 years ago and it became readily established where planted and has now spread widely. 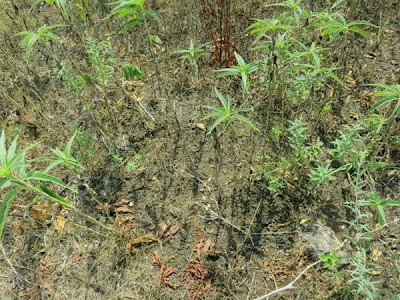 The photo shows a rather large patch at the edge of an open savanna. It may seem odd to see this species in an area full of birches. Where are the oaks? However, if you start to look around you will probably see an oak grub or two. These small grubs are often years old, being burned back each year by our annual savanna fires, and readily support A. grandiflora. According to greenhouse research by Musselman from UW-Milwaukee, seedlings never get past the cotyledon stage unless they infect oak roots. Although this species is often called a "hemiparasite", it looks like an obligate parasite to me. It is an interesting "obligate" however, since it does not destroy its host. This is one of the showiest species in flower right now, and well worth seeking out in our ridge-top savannas. 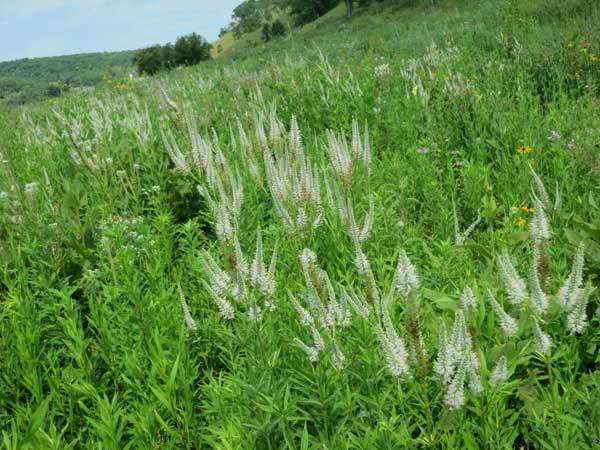 Despite the prolonged drought, some prairie plants are doing very well and seem to be flourishing. For instance, Culver's root (Veronicastrum virginicum). This is a species that grows well in savannas and wet-mesic prairies. However, this year the drought has suppressed it in our savannas, but it is doing better than ever in the wet-mesic prairies. Although reasonably common (it has a C value of 6), we seem to have hit the right conditions in the Valley Prairie, as the photo shows. The soil in this prairie ranges from dry to dry mesic at one side to wet mesic and almost wet at the other side. It is near the wet end that Culver's root is flourishing, growing in a relatively narrow strip. Our backyard is fairly small, which is good because we spend most of our time working on a 140 acre natural area. However, in her "spare" time Kathie has done a great job of "restoring" it. Our backyard is best called an open oak woodland, because it has some reasonably mature white oaks. Because of the shade, lawn never did well, and after years of mowing, I finally convinced Kathie to convert it into a "forest floor". We had already planted woodland species around the edge of the lawn, so the logical step was to get rid of the lawn and extend the forest understory. The lawn fell easy prey to glyphosate, and by last November the ground was bare. A good mix of open oak woodland species was planted, and a narrow path was delineated with judicious use of wood chips. Despite the June drought, everything has grown well, and we now have quite a colorful backyard. 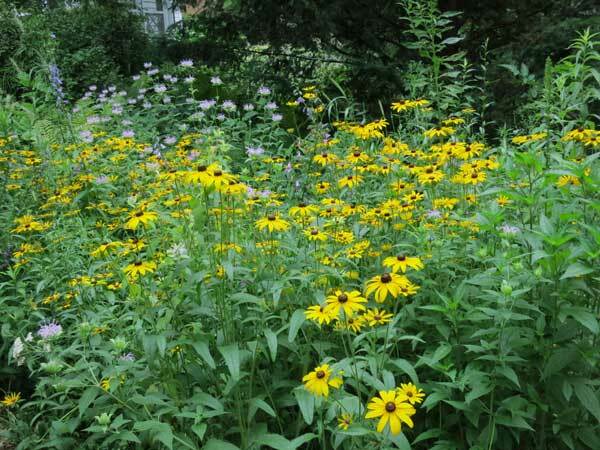 In addition to the bergamot and black-eyed Susans seen in the photo, other species include American bellflower, white and red baneberry, yellow and purple hyssop, purple milkweed, bottle brush grass, and a lot of other species. A major attraction here is that there is no lawn to mow. Another feature is that there will be a continual progression of native species throughout the year. This represented a lot of work for Kathie, but hopefully all that will be needed now is judicious hand weeding, and occasional planting of new species. I was quite impressed by how effective glyphosate was in turning the lawn into bare soil. With the good shade that the herbaceous species create, we should have no problem in keeping grass from coming back.